Ray Paulley was in his mid-40s when he began noticing swelling and pain in his joints. Like anyone would do in his situation, Ray took himself to the GP to try to figure out what was causing the pain. He was diagnosed with gout and, for many years, took gout medication to try and keep his symptoms under control. However, when he turned 60, Paulley, from Greystanes, NSW, noticed the medication was no longer working and instead seemed to be making the swelling and pain even worse. He sought out a rheumatologist, who sent him for blood tests and eventually diagnosed Paulley with a condition known as psoriatic arthritis — a condition that results in inflammation of the joints. Paulley was told he’d been living with psoriatic arthritis for 20 years and that the earlier misdiagnosis had caused irreversible damage to his joints. “I was, I suppose, misdiagnosed, although it’s easy to say that because I don’t believe unless you’re looking for it, it’s not an easy condition to diagnose,” he told Starts at 60. Now 73, the grandfather is sharing his story to help the 50,000 other Australians living with psoriatic arthritis receive a proper diagnosis. Psoriatic arthritis usually only impacts people who already have psoriasis, an inflammatory skin condition which is caused by an overactive immune system that mistakenly targets the body and causes the joints to become painful, stiff and often swollen. Around 450,000 Australians and 125 million people around the world live with psoriasis. One in eight of those go on to develop psoriatic arthritis. Still, it can take a long time to receive a proper diagnosis, as was the case with Paulley. “The difficulty and the reason psoriatic arthritis unfortunately often has a delay in diagnosis is people often don’t link the presence of a skin disease with disease affecting tendons, ligaments and joints,” Irwin Lim, Rheumatologist at BJC Health and the health professional who diagnosed Paulley’s condition correctly, told Starts at 60. “The diagnosis is basically a bit of detective work. Those with psoriatic arthritis typically notice pain, swelling and stiffness in at least one joint, the buttocks, lower back and neck, as well as pain in the tendons. They can also develop thick or coloured nails and pain and redness in the eyes. For Paulley, his condition impacts him both physically and mentally and the difficultly of completing simple daily tasks, such as putting on his socks, leaves him feeling angry and frustrated. Still, he tries to remain positive. Paulley originally used various tablets to manage his condition but now uses injectable biologicals every fortnight. Biologics are medicines that are made using cells to produce particular types of protein that help treat a range of diseases, including cancer, diabetes and rheumatoid arthritis. They have to be injected directly into the body as the digestive system would destroy the delicate balance of the medicine if they were ingested. Paulley requires a blood test every six month to ensure the biologicals are continuing to control his condition. There is currently no cure for psoriatic arthritis but the medication prescribed stops the condition from attacking the joints – even if it can’t reverse damage that’s already been caused. The government also continues to invest in treatments and earlier this year listed a drug called TALTZ to the PBS. TALTZ is used to treat plaque psoriasis and psoriatic arthritis and works by reducing inflammation and other symptoms of the disease such as scaling, itching and pain. It’s used in adult patients with moderate-to-severe plaque psoriasis who are candidates for systemic therapy or phototherapy. While Paulley doesn’t take this specific antibody, it’s another option for patients looking to reduce joint pain, improve physical function and clear the skin. “They [patients] may not continue to be effective on one medication, so having a range of medications available is really good,” Andrew Mills, CEO Arthritis Australia, told Starts at 60. “The GP can then prescribe that patient onto an alternative medication where indicated that patient has not be successfully treating to target, which means trying to achieve remission. 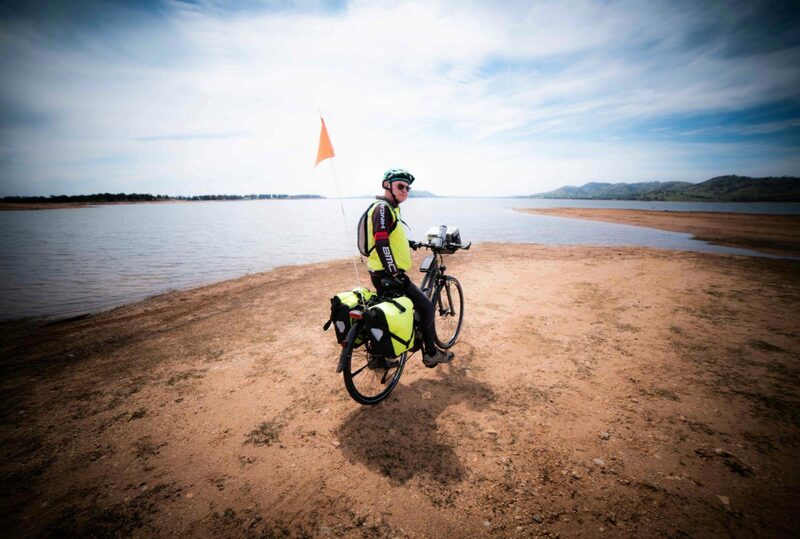 In addition to his medication, Paulley uses exercise as a way of managing pain and finds cycling is an activity he enjoys, and one that also eases the side effects of his condition. He deals with pain in his right hip, but had a bicycle modified so he can still ride to the best of his ability. For those living with psoriatic arthritis, exercise is extremely important to keep muscles, ligaments and tendons working well and to maintain bone density. “It’s very clear that being active and being involved in regular exercise actually helps limit the amount of symptoms and the amount of loss of function that occurs in the disease,” Lim added. As for Paulley, he said the key to managing the condition is to get a proper diagnosis, remain positive and don’t let the diagnosis get in the way of living. It’s always important to speak to a health professional or a rheumatologist if you’re experiencing any symptoms associated with psoriatic arthritis. Have you ever been misdiagnosed with a health condition? What impact did it have on your life?